Descending to Base Camp After Submitting Mera Peak. Descending After Submitting Mera Peak. The Mera Peak (6461m) is situated in the Everest region of Nepal, which is popular for the climbing activities. The huge range of snow in the highest trekking peak in Nepal and the long climbing trip makes it adventurous. 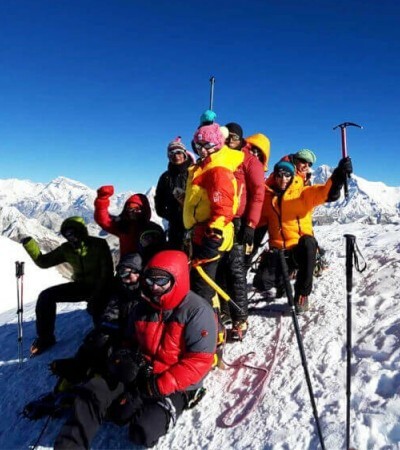 Physically fit and fine adventure lovers try the Mera Peak Climbing in the Khumbu area and get the views of the Everest Himalayan region as Everest, Lhotse and other incredible white peaks. The trip of Mera Peak commences from Lukla, which is a short and a wonderful flight from Kathmandu. The trek continues through the charming alpine valleys on the way to Mera Peak. When the altitude increases, the trekking gets tougher and the scenarios change. The forest ranges are occupied by the alpine meadows and glacial rocks. The all kinds of floras help to add the extra charm in the trekking trail. Similarly, the scenarios of the Hinku valley are just awesome. Mera High Camp is beautiful which offers the very closer views of Mt. Everest, Makalu, Nuptse and so on.The Mera Peak base camp is located at 5300 meters altitude. In the same way, the climbing guides provide a short climbing training and the ways to use peak climbing equipments. It helps the climbers to acclimatize with the high altitude and get the skills to face the challenges. It is a long, but pretty nice track to ascend the Mera Peak. The Everest Himalayan panoramas lie in front of the climbers, who can also explore the high Himalayas of Makalu, Cho Oyu and others. Overall, the Mera Peak Climbing is considered as the adventure Nepal activity and anyone can join it as the Adventure Holidays Asia. The expert team of Rising Adventure offers the excellent services and suitable itinerary for the Mera Peak climbing trip in the Khumbu region. Our Himalayan leaders, kitchen team and porters are highly experienced and professional. Have a great trip with our expertise. Day 17 :Fly to Kathmandu.